Older-generation Macs used tray-loading drives with manual eject holes you could access with a straightened paper clip. Unlike Windows PCs, Macs don't allow you to remove CDs simply by opening a media-drive door or ejecting a disc from a slot-loading drive. In fact, Macs won't eject discs while they're in use by an application or process. Once you finish accessing a CD, you can eject it from the Finder -- unless you've chosen not to display desktop icons for optical media. To work around the invisible-disc problem, substitute other commands and methods to extricate your CD. On some Apple keyboards and on third-party keyboards designed for compatibility with Macs, you'll find a dedicated Media Eject key at the top right corner. The key carries an icon that looks like an underlined pyramid, similar to the ejection-button markings on DVD and Blu-ray players. When you press and hold the Media Eject key, the Mac releases the disc in its internal or attached external optical drive. If your keyboard layout doesn't include a Media Eject key, the F12 key substitutes for it. Apple's iTunes and Disk Utility applications include provisions for ejecting optical discs through software. In iTunes, you can press "Command-E" or open the "Controls" menu and choose "Eject Disk." In Disk Utility, press "Command-E," open the "File" menu and choose "Eject" or click on the name of the disk in the sidebar and press the "Eject" button at the top of the floating window. Some third-party applications also include controls for ejecting discs, especially software designed for burning DVDs and CDs. 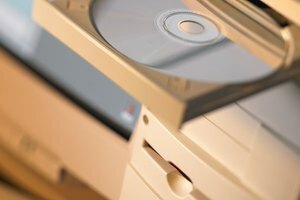 If keyboard and software controls don't succeed in ejecting your recalcitrant disc, you can start or restart your computer to take advantage of a power shortcut designed to accomplish the task. After you press the computer's power button or choose "Restart" from the Apple menu and immediately after you hear the startup chime, press and hold the main -- or only -- button on your mouse. Your Mac should eject the disc before it finishes starting up. If you rarely use CDs or DVDs and don't use a Mac with a built-in optical drive, you may have set up your Finder preferences so OS X doesn't display icons for these items on your desktop. The simplest ways to eject an optical disc is to take advantage of desktop icons that you can drag to the Dock's Trash icon or select with a mouse click so you can use the "Command-E" keyboard shortcut. To make optical-media desktop icons visible, switch to the Finder, open the "Finder" menu and choose "Preferences." In the General tab of the Finder Preferences dialog box, activate the check box for "CDs, DVDs, and iPods" to make optical media show up on your desktop. This change takes effect as soon as you click on the check box. 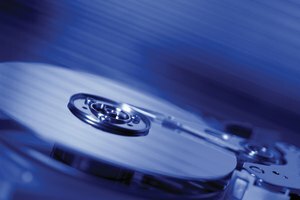 Apple Inc.: What's the Difference Between a "Disc" and a "Disk?" Mott, Elizabeth. "How to Eject a CD That Doesn't Show Up on the Desktop on a Mac." Synonym, https://classroom.synonym.com/eject-cd-doesnt-show-up-desktop-mac-11405.html. Accessed 17 April 2019.